Frosted branch angiitis (FBA) is typically a bilateral diffuse retinal periphlebitis that may occur in a number of varying conditions. Here, we report a case of a young female who presented with bilateral sudden diminution of vision with a fundus picture of FBA. A series of investigations were carried to rule out the possible underlying diseases, and significant recovery of vision was seen on treatment with oral steroids. Frosted branch angiitis (FBA) was first described in Japanese literature by Ito in 1976 in a 6-year-old child. It is a rare entity with approximately 100 cases (based on PubMed journals and case reports research) described in literature till 2016. The diagnosis is made clinically with typical periphlebitis (veins being involved more commonly than arteries) in a pattern of frosted branches of a tree and can be supplemented with findings on fundus fluorescein angiography (FFA). A 31-year-old female was referred with sudden, painless, bilateral diminution of vision for 5 days with associated fever and headache for 2 weeks. Her previous investigations included lumbar puncture which showed lymphocytosis, magnetic resonance imaging suggestive of meningitis, cerebrospinal fluid (CSF), polymerase chain reaction (PCR) negative for tuberculosis, and sterile CSF culture. The patient was treated with intravenous antibiotics and intravenous/oral steroids by a physician in charge. On examination, best-corrected visual acuity in both eyes was 5/60. Both eyes had nongranulomatous keratic precipitates with 2+ cells and 1+ flare in anterior chamber (AC). Vitreous showed 2+ cells and vitreous haze of grade 2+. In funduscopy, there was diffuse retinal perivascular sheathing (mostly phlebitis) and scattered intraretinal hemorrhages with macular edema in both eyes. The optic discs were swollen bilaterally [Figure 1]a and [Figure 1]b. Her clinical picture was compatible with FBA. FFA showed leakage from the retinal veins and the optic nerve head. There was no evidence of capillary nonperfusion or neovascularization [Figure 2]a and [Figure 2]b. Spectral domain-optical coherence tomography of the macula showed a subfoveal detachment with subretinal precipitates in both eyes [Figure 3]a and [Figure 3]b. Subsequent workup for various infectious, noninfectious, and masquerade syndromes was done, which included Mantoux test, chest X-ray, enzyme-linked immunosorbent assay for human immunodeficiency virus, venereal disease research laboratory, Treponema pallidum magglutination, serum angiotensin-converting enzyme, serum antinuclear antibody, and peripheral smear for leukemias. PCR of vitreous was done for cytomegalovirus (CMV), herpes simplex virus, varicella zoster virus, toxoplasmosis, and tuberculosis. Above investigations ruled out the common etiologies, and a diagnosis of primary idiopathic FBA was made. The patient was started on oral steroids 1 mg/kg/day and topical steroids/cycloplegics for Anterior chamber reaction. Two injections of posterior sub-Tenon's triamcinolone were given in the right eye and three injections in the left eye over a period of 2½ months, and systemic steroids were tapered over 6 months. 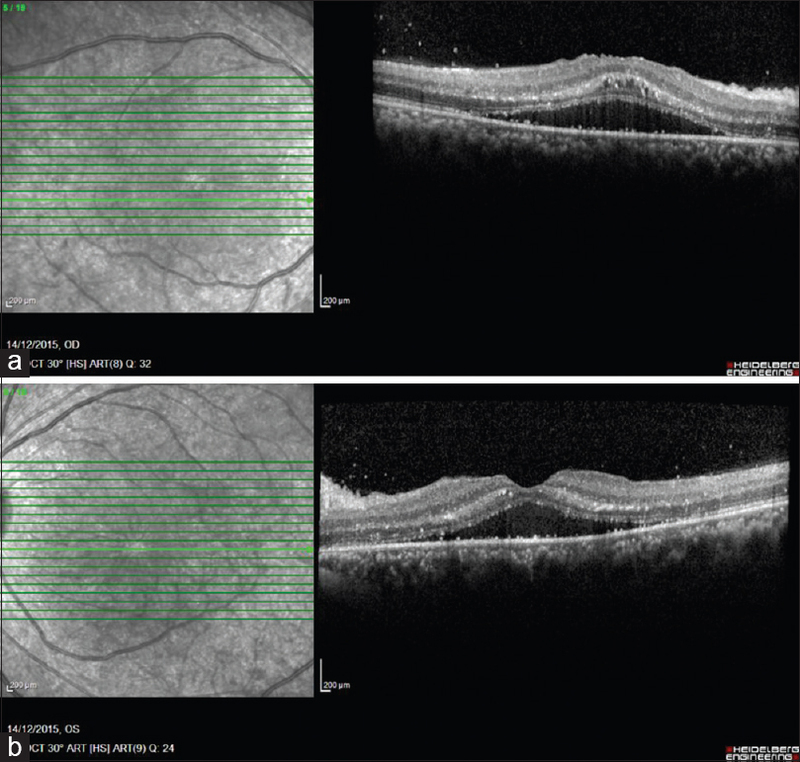 Vision improved to 6/6P in both eyes with a resolution of inflammation both clinically and angiographically. At 6-month posttreatment follow-up, the patient maintains a vision of 6/6p in both eyes with no evidence of reactivation [Figure 4]a and [Figure 4]b.
FBA is not an etiological diagnosis in itself but a clinical picture which may have varying causes. Based on the underlying pathology, Kleiner  suggested classifying patients into three different subgroups. The first group comprises patients affected by lymphoma and leukemia that can present with a frosted branch-like appearance in the fundus. The second group includes patients with associated autoimmune or infectious diseases which can have FBA as a clinical sign of the underlying disease. From review of the literature, CMV  has been found to be the most common underlying infectious pathology followed by toxoplasmosis. These cases may show focal retinitis in addition to the vasculitis. Among autoimmune diseases, Behcet's disease is most frequently associated with FBA. The third group comprises patients with no identifiable cause and is classified as having primary idiopathic FBA. Patients with primary idiopathic FBA tend to be of younger age group, with bilateral involvement. FFA in these cases does not show any nonperfusion or neovascularization. They have an excellent response to oral steroids. This case report highlights the clinical features of an uncommon but easily identifiable retinal vasculitis. We emphasize the importance of detailed history taking and clinical examination with tailored investigations in a case of FBA. Ito Y, Nakano M, Kyu N, Takeuchi M. Frosted branch angiitis in a child. Rinsho Ganka Jpn J Clin Ophthalmol 1976;30:797-803. Kleiner RC, Kaplan HJ, Shakin JL, Yannuzzi LA, Crosswell HH Jr., McLean WC Jr., et al. Acute frosted retinal periphlebitis. Am J Ophthalmol 1988;106:27-34. Geier SA, Nasemann J, Klauss V, Kronawitter U, Goebel FD. Frosted branch angiitis in a patient with the acquired immunodeficiency syndrome. Am J Ophthalmol 1992;113:203-5.